Koji Igarashi is best known for work on countless Castlevania games. He’s left Konami and is now ready to work on a new one. It’s not called Castlevania. It’s not for Konami. But it might just be what fans have been eagerly awaiting. The game is Bloodstained: Ritual of the Night. It’s still quite early, but this is a 2.5D action game for consoles. And it certainly appears to evoke the Castlevania games that Igarashi made and that made Igarashi famous. Last year, Igarashi first talked to Kotaku when he announced was leaving Konami. The Tokyo-based game company had taken him off the Castlevania series and had him making social games.Considering his skill set, that didn’t seem to be the best use of his talents. At that time, I asked if he was going to crowdfound his next game. He said it was an option, as was venture capital. Turns out, Iga decided to do a mix of both crowd and venture funding: He’s launching a Kickstarter to prove to outside investors that enough gamers want the style of games he makes (a genre the Kickstarter dubs “Igavania.”) The goal is to put it on PC, Mac, Linux, Xbox One, and PlayStation 4, and it’ll require funding beyond the Kickstarter to make that happen—if that’s going to happen. Iga is going to enlist Inti Creates, the studio that did Mega Man 9 and are currently doing Mighty No 9, for development duties. Long-time Castlevania collaborator Michiru Yamane is set to compose the musical score, and Iga is directing and producing. Ritual of the Night is gothic, like you’d expect. It’s set at the end of the 18th century, and the backstory tells of the Alchemist Guild, a power-hungry organization that spreads stories of demons set to destroy the world if mankind puts too much faith in science. As scientific progress advances despite their warnings, the alchemists begin using children to lure demons to Earth, knowing that the world will then beg them to stop the demonic hordes. The Guild suddenly vanishes, and a castle filled with demons appears. Guess some hero is going to have to go explore it! Aside from the setting, what makes Iga games, well, Iga games, is the way they’re played. It’s still early in the development process, but Ritual of the Night sounds like it’ll have an emphasis on crafting, turning magic powers into what are known as “magi-crystals” for new skills and the like. Which, if pulled off successfully, this could be an interesting spin on this genre. Kotaku: How is the combat similar to your Castlevania games? How is it different? Koji Igarashi: This is designed to be a game for the fans, who have been quite clear over the years that they really like the Igavania style of games that I design. So key elements like being able to gain special powers from enemies, lots of drops from enemies, and a new and robust weapon crafting system will be the core gameplay. Additionally you’ll be able to upgrade the sub-parameters of some abilities, making it much more customizable than my previous games. Is this the game you had always wanted to make but couldn’t during the end of your tenure at Konami? Absolutely, yes. I’ll finally be able to make a game that uses a controller. Why did you decide to crowdfund this game? After a very long process and many unsuccessful attempts with publishers we finally were able to find external investment for the project to cover most of it. However, the investment came with some conditions. We need to prove that market really wants another Igavania game. This Kickstarter will either prove that my fans were right, or that the unsupportive publishers were right. At the bare minimum goal, we’ll be able to make the game in its basic form. But this is a big opportunity for me to really do something big now that I’m independent, so I hope we can unlock more stretch goals and make a much deeper game. 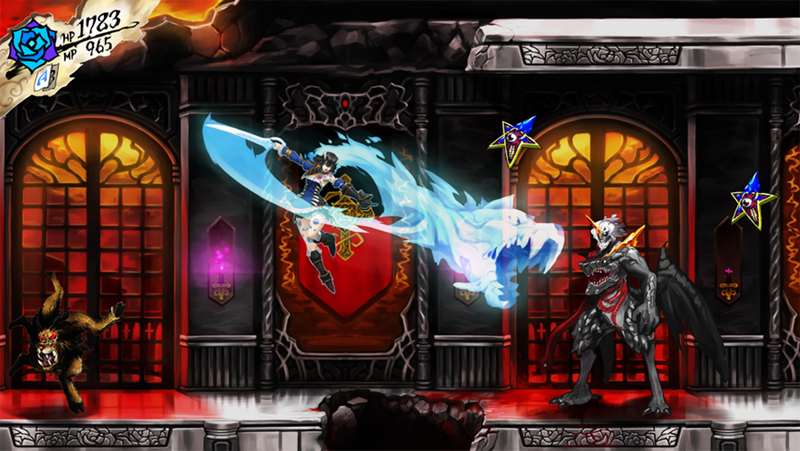 I see that Bloodstained is slated for PS4/Xbox One/PC, correct? How will you cover the dev costs for those platforms? I’m not convinced meeting the $500,000 crowd funding goal alone will work. As I mentioned earlier, we have investment support covering most of the costs. We understand there could be some concern among fans about a crowd-funded game not being released. But in this case, the Kickstarter campaign is necessary to prove there is actual interest in another Igavania game. And if the initial goal is cleared, then stretch goals will allow us to add to the game. Why didn’t you call the game Igavania? Heh, that’d be kind of tacky. I’d rather use a title that speaks of the game content, not the creator. What’s a realistic ETA for how long it would take to make the game? I realize that deadlines can change and there are lots of moving parts, but how long do you think it would take? Well, the reality is, it’s a new environment for developing the game, and we’re building things from the ground up (without re-using any sprites). Based on my experience, we’re looking at about 18 months of development, but it’s always hard to pin an exact number on a new production like this, so that’s just my best guess. Are you excited to make another Iga game? You have no idea! A creator’s value is determined by his next game, but a creator unable to make the sort of games he wants isn’t really a creator at all. He is just a man… and we all know what that is.